The inclusion program is a socio-cultural project which is divided in different cycles. Each of them lasts 9 months and ends with a special artistic performance. The concept behind the performance is to get orphans and children deprived of parental care working with their talented peers under the direction of distinguished international and national artists. Involvement in art is the perfect way for children to meet their own body (new) as well as to discover their own artistic talents. Our program promotes the reintegration of children into society by using various artistic means (music, dance, singing, theater, and design) combined with athletics and study of social issues. It aims to involve children from different backgrounds and with different interests and talents. The pilot cycle "Venice. City of Hope" was in 2012-2013 under the auspices of the former "Oscar" winner Volker Schloendorff. Participants were children facing vulnerabilities of the Centres "Our Kids" and "Home of Happy Children" and also from the "Aspern" Foundation. 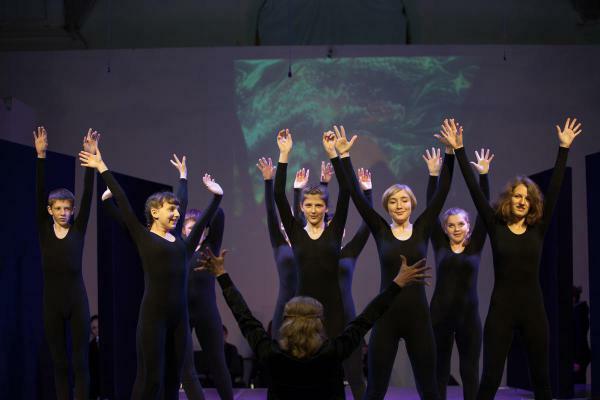 They performed together with students of the Serge Lifar Dance Academy, The Rizoma art-studio, the Brovary School of Physical Education and the "Shchedryk" children's choir. The second cycle "The way to the sun" started in September 2014 and ended in October 2015. Under the work of Olena Leonenko-Głowacka and together with professional artists the children of the Centre "Our Kids" and children from the Dnipro district of Kyiv performed at the children festival "Arsenal of Ideas" and at the Ivan Franko Theatre in Kyiv.